Collagen supplements can offer a variety of surprising benefits. Here is an overview of collagen supplements and a few recommended brands you can try. People spend thousands of dollars each year trying to prolong their battle against the aging process. Between botox, plastic surgery, and a whole host of other procedures, people will go through any number of measure to make themselves look as young as possible. That’s why collagen supplements have become so popular recently. It doesn’t require a medical procedure, or a medical professional to administer it. It’s an all-natural product that can be found in a variety of sources, and it works with your body to make your skin healthier and stronger, along with a whole host of other benefits. With so many different supplements out there, we wanted to provide you our thoughts on five of our favorite collagen supplements available in the market. Proteins are the building blocks for all the organs, muscles, and tissue we have inside of our body. Collagen is a family of proteins that help make up the structure of our bones, muscles, skin, tendons, and cartilage. Because it’s used in so many different sources, the amino acids that makeup collagen are actually the most abundant type of aminos in the body. Now here’s the kicker: our body produces collagen throughout our lifetime, but as we get older, the rate at which our bodies produce collage becomes less and less. That’s exactly the reason that the aging process is so visible: because the skin loses the strength and elasticity that collagen is responsible for. If we want our skin to function normally and appear more youthful, we need to ensure that the two main layers that comprise our skin — the epidermis and the dermis — gets the collagen that it needs. Naturally, then, that’s where collagen supplementation enters the picture. Since our bodies will produce lesser amounts of it as time goes on, we can look to external sources to supplement the amount of collagen our body can use. As you might’ve guessed by now, many people have begun taking collagen supplements with the hope of slowing down the effects of the aging process. Collagen supplements have become increasingly popular because of the belief that it can improve the quality and strength of your skin, hair, and nails. There is a growing body of research that has linked the consumption of collagen peptides to reduced skin wrinkles and healthier skin. More and more people will tell you that taking collagen supplements makes their skin feel stronger and shinier. As mentioned, because our bodies produce less of this substance as we get older our skin wrinkles, hair thins, and nails become frailer, because the collagen that supports them is less abundant in our body. When dermatologists give patients prescription retinoids to help with such issues, those drugs work by increasing the body’s production of collagen. Many times, when you see someone getting an injection to make their skin look less wrinkly or to make their lips look fuller, they’re actually getting collagen injected into those areas. One of the most widely studied and accepted benefits of collagen supplementation is the reduction of symptoms of osteoarthritis and rheumatoid arthritis. It’s believed that the additional collagen ingested reduces inflammation within the body, which directly lowers the amount of pain that people with arthritis and other joint-based diseases often have to deal with. Collagen doesn’t just reduce the inflammation caused in your joints. There is evidence suggesting that the amino acids found in collagen — most specifically one called glycine — can reduce gastrointestinal inflammation as well. Because the modern diet contains a lot of processed foods, or meat that comes from livestock that has been kept in poor living conditions, the number of people who suffered from issues caused by gastrointestinal inflammation is growing at a rapid pace. Collagen not only helps with ensuring your food moves properly through your digestive tract, but it can also help heal any inflamed or damaged stomach lining. By and large, the potential for adverse reactions when taking collagen supplements is minimal. However, women who are pregnant or breastfeeding should consult their physician before taking collagen supplements, as the potential effects for both the mother and the child have not been fully studied. Since collagen primarily comes from ground-up animal parts, there’s the potential for having a dangerous level of heavy mental content. While there is not much evidence that clearly demonstrates a link between collagen supplementation and heavy metal poisoning, it’s probably still best for you to ensure your supplement has been certified for contaminants (or a lack thereof) by a third party. There is a chance for individuals to suffer from an allergic reaction to collagen sources or supplements. In particular, if someone happens to be allergic to any of the main sources of collagen (bovine, porcine, poultry, fish, or shellfish), there’s a chance that they could suffer a reaction by consuming collagen that’s made up of proteins from those sources. These reactions most often take place when the collagen is applied topically to the skin, though it is possible to suffer reactions including constipation, fatigue, nausea, and vomiting from ingested collagen. Super Collagen Plus C by Neocell Laboratories contains both type 1 and type 3 collagen peptides. 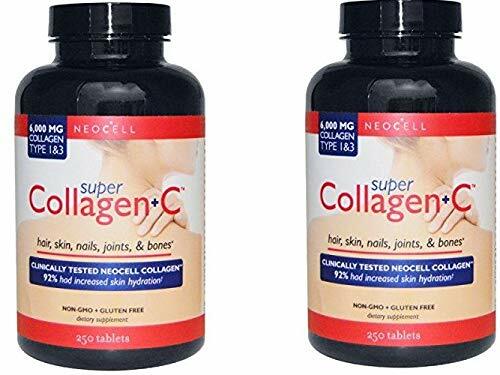 These two types of collagen are the main types found in the connective tissue comprising 90% of the body’s total collagen content. When using this supplement, the body not only takes these two types of collagen peptides and applies them where they’re needed most, but the supplement also acts as a messenger to trigger the synthesis of new collagen fibers. And because the molecular makeup of Super Collagen is very similar to the amino acid structure of our own body’s collagen, people who take Super Collagen Plus C will enjoy a 90% absorption rate into the blood stream. REAL CERTIFICATIONS: Many companies claim to be, but our Collagen Powder is actually 3rd party certified by the Paleo & Keto Foundation, and non-GMO verified by the IGEN program. 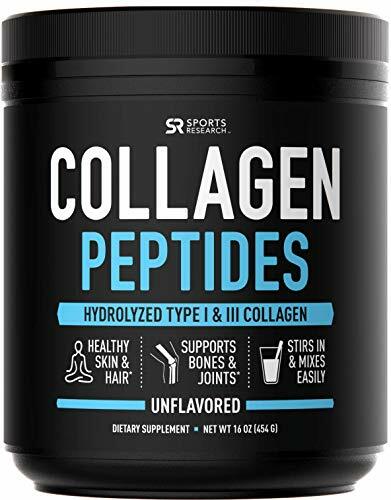 Premium Collagen Peptides by Sports Research is a hydrolized collagen peptides supplement. A hydrolized protein is one that’s been naturally broken down into a powder, but the more important distinction is that the body digests proteins in this form easier and faster. 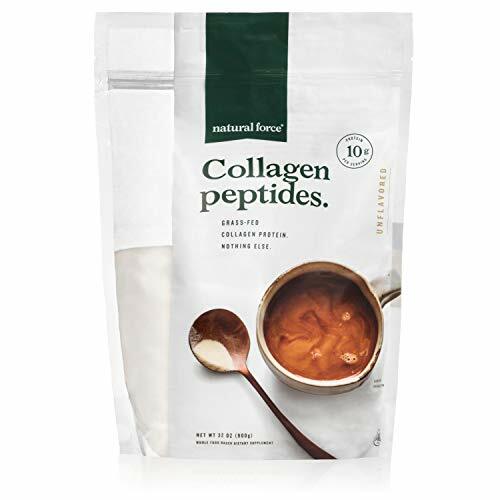 Lots of consumers mix the unflavored Premium Collagen Peptides powder into juices, smoothies, their morning coffee, or even into salad dressing, and find it very easy to consume in those forms. In addition, Premium Collagen Peptides contains 20 additional amino acids, which consumers have said helps with them with their recovery times after strenuous exercise. Health Logics proudly claims that millions of “happy customers” can vouch for the company’s line of health supplements. 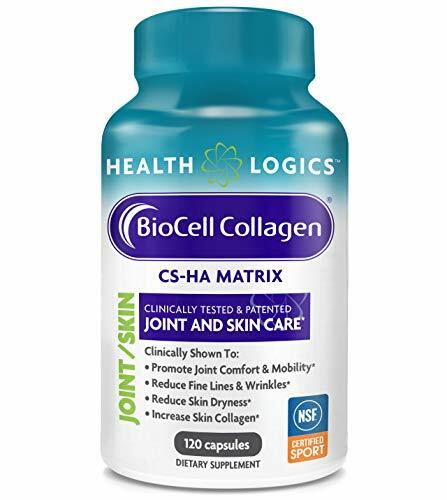 Their BioCell Collagen Joint & Skin Care Supplement is comprised of a patented, fast-absorbing composition that cannot be found in any other supplement or ingredient blends. Benefits include increased blood microcirculation of facial skin for a healthier glow, enhanced recovery after intense resistance exercise, and improved joint comfort, mobility, and quality of life. Nutrient-dense: Collagen Peptides offers 20g of collagen per serving, sourced from one single ingredient. 0g sugar: A great option for individuals looking to minimize their sugar intake. Many benefits: Helps improve hair, skin, nails, ligaments, tendons, bones and joints. 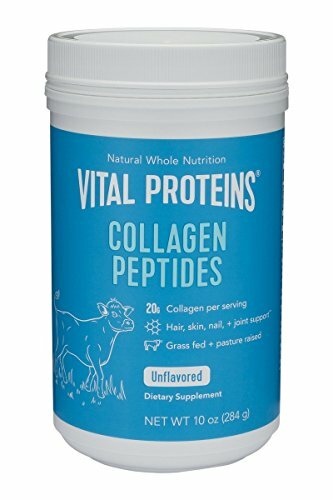 Vital Proteins’ Collagen Peptides is another powder-based collagen that’s easily mixed into hot or cold liquids. The difference between this and other hydrolyzed collagen products is that hydrolyzed collagen is made from animal by-products, including skin, bones, and connective tissue while collagen peptides are from the skin. Collagen Peptides are made by extracting the collagen in boiling water, and then the extracted collagen put in an evaporator concentrated, desiccated with drum driers, and pulverized. Vital Proteins’ product is Whole30 approved and Paleo-friendly, containing no preservatives or hormones and is GMO-free. Natural Force® states that their Collagen Protein product is “Ranked #1” among “Best Collagen Supplements,” although they don’t really state where that top ranking came from. Regardless, their Type I collagen is produced using a special method to ensure the highest quality and most bio-available collagen peptides on the market. The hydrolyzed collagen powder is Non-GMO, Gluten Free, and Certified Paleo Safe by the Paleo Foundation. It is dairy-free, gluten-free, and Keto-friendly. While tablets have made taking any supplement easy, since you don’t have to deal with any types of weird tastes, many collagen products require you to take multiple pills multiple times per day. Honestly, who has time for that? Taking your collagen supplement shouldn’t become job in and of itself. That’s why our choice for the best collagen supplement goes to Premium Collagen Peptides by Sports Research. The fact that one two-scoop serving contains a robust 22 grams of pure collagen protein, comes in a powdered form that easily mixes into any liquid of choice, and is optimally absorbed into the bloodstream makes it an easy yet effective way to add collagen to your daily diet. What are the Best Krill Oil Supplement Brands?